There are 35 Assisted Living Facilities in the Bedford area, with 2 in Bedford and 33 nearby. The average cost of assisted living in Bedford is $2,257 per month. This is lower than the national median of $3,346. To help you with your search, browse the 188 reviews below for assisted living facilities in Bedford. On average, consumers rate assisted living in Bedford 4.1 out of 5 stars. Better rated regions include Garfield Heights with an average rating of 4.5 out of 5 stars. Caring.com has helped 5 families in Bedford find high-quality senior care. To speak with one of our Family Advisors about assisted living options and costs in Bedford, call (855) 863-8283. Promotion ends in 7 days! Get 1/2 off your New Resident Fee when you lease by April 30! * See our Sales Director for details. Assisted Living or In-Home Care? The city of Bedford is a suburb of Cleveland located near Tinker's Creek. It has a large population of seniors, with around 15 percent of the city's estimated 12,600 people aged 65 or older. Seniors wishing to settle in an assisted living facility in Bedford have a wide range of choices, with two facilities in the city and a further 56 in communities nearby, including Cleveland, Macedonia and Sagamore Hills. The Ohio Department of Health provides different levels of licenses to these facilities, depending on their size and the level of care provided, and also monitors them regularly. Bedford, a suburb of Cleveland, is a member of the AARP Network of Age-Friendly Communities, meaning that its elected leadership “has made the commitment to actively work toward making their town, city or county a great place for people of all ages,” according to AARP. The Bedford area is home to world-class medical facilities, including University Hospitals Bedford Medical Center, in the event of medical emergencies or illness. Seniors receiving income from Social Security will appreciate the fact that they don't have to pay income tax in Ohio. However, seniors who receive a pension or income from a retirement fund are subject to income tax, though some tax credits are available. Sales tax in Ohio is also higher than the national average which can take money from your assisted living budget. Housing costs in Bedford are extremely low, leading to an overall cost of living almost 17 percent lower than the national average. However, seniors in assisted living will still find the city an expensive place to live, as groceries and health care are around 8 percent higher than average. Bedford lies in the Cleveland-Akron-Canton metroplex area. which has very poor air quality, according to the American Lung Association. It has the tenth highest annual particle pollution levels in the country and also rates poorly on ozone pollution and 24-hour particle pollution. This may affect the health of seniors with respiratory conditions. Bedford experiences cold and snowy winters, with an average of 59 inches of snow each year and January lows of just 19 degrees. There are generally only 165 days of sun each year, which can keep seniors indoors more than they'd like. Assisted Living costs in Bedford start around $2,257 per month on average, while the nationwide average cost of assisted living is $4,000 per month, according to the latest figures from Genworth’s Cost of Care Survey. It’s important to note that assisted living rates in Bedford and the surrounding suburbs can vary widely based on factors such as location, the level of care needed, apartment size and the types of amenities offered at each community. 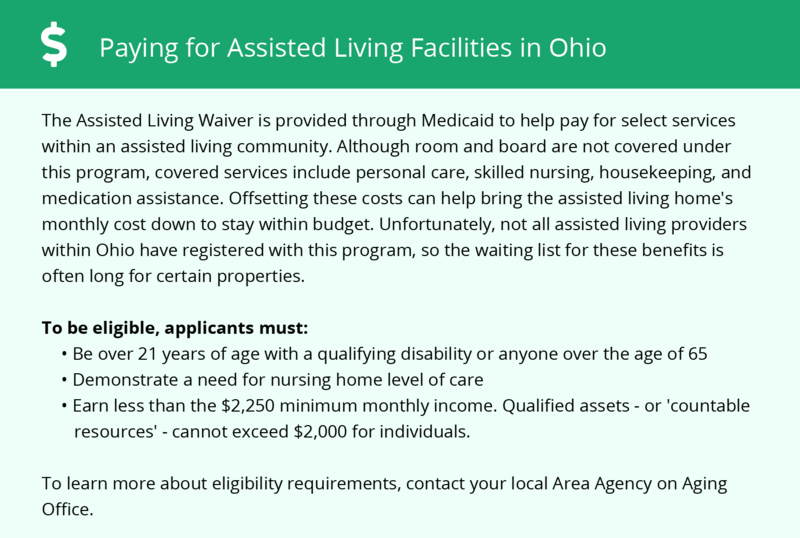 Eligible assisted living facility residents in Bedford can find financial assistance through the Assisted Living Waiver Program, which covers room and board expenses. Seniors who receive Social Security income may also be eligible for the Optional State Supplement. 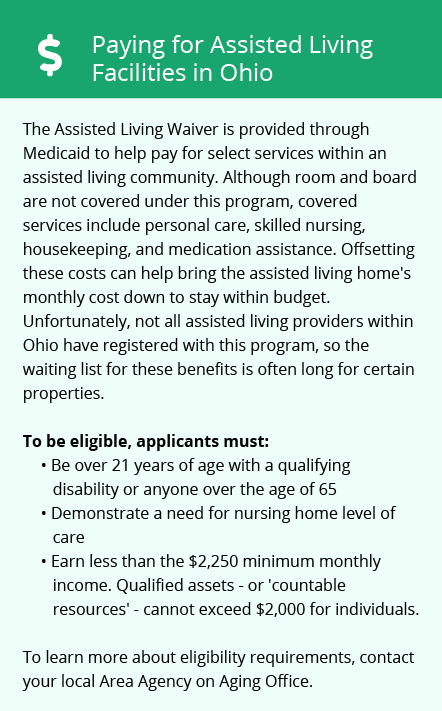 Learn more about these programs, plus who’s eligible, on our Assisted Living in Ohio page. For more information about different ways to finance assisted living, visit our Assisted Living in Ohio page. Bedford and the surrounding area are home to numerous government agencies and non-profit organizations offering help for seniors searching for or currently residing in an assisted living community. These organizations can also provide assistance in a number of other eldercare services such as geriatric care management, elder law advice, estate planning, finding home care and health and wellness programs. To see a list of free assisted living resources in Bedford, please visit our Assisted Living in Ohio page. Bedford-area assisted living communities must adhere to the comprehensive set of state laws and regulations that all assisted living communities in Ohio are required to follow. Visit our Assisted Living in Ohio page for more information about these laws.